EAFRD funding assisted Vlashev-darvorezba Ltd, a company producing wood-carved furniture, acquire a robotic control system for copying wood produced by hand, thus making the company more competitive in the market. Since 2006 Vlashev-darvorezba Ltd designs and develops all kinds of furniture with wood-carving, iconostasis and restoration. Export to the EU is the main source of the company’s profit. The local competition in this industry sector is very weak with only single private studios and workshops and the main competitors are companies outside Bulgaria. Prior to the project the company used a manual three dimensional copy router for wood-carving – pantograph, which has lower productivity. The objective was to improve the quality of production using a robotic control system to copy manual carving and thus become more competitive in the market. The purchase of a robotic three dimensional profiler was the main project activity undertaken towards the achievement of the project objective. 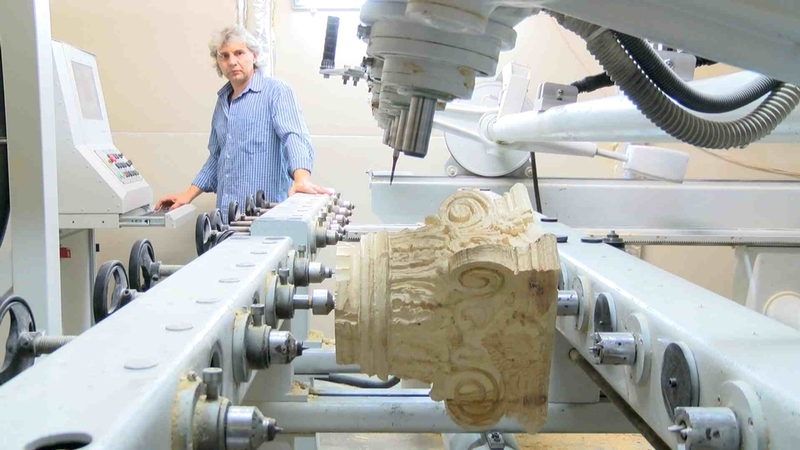 The robotic computerised pantograph pre-processes ornaments for each model and maximum uniformity of the ornaments and speed of production is ensured by the use of a three dimensional profiler which can help a wood carver replicate a pre-processed ornament. This new system of word carving ensures: a) maximum uniformity of the manufactured ornaments; b) greater speed of production; c) better position of the company in the market. This new technology has helped the company: a) retain existing and open new jobs; b) increase its turnover; c) become a preferred partner of other European companies; d) introduce a high-tech production in the furniture industry, unique in Bulgaria and the Balkans. It became clear that the price of the initial investment was too high for the company. The decision was taken to find a Bulgarian company that could make the "robotic part" of the machine at a more competitive price. A Bulgarian manufacturer was identified and used resulting in the project benefiting two companies.